The sous vide steak was bagged with a bit of garlic powder and a few drops of liquid smoke. Then salted for an hour while drying after removal from the bag. The grilled steak was seasoned only with salt and then rested for an hour. I cooked and ate the grilled steak first, for what it's worth, speaking as a quondam protein chemist. Is there a reason why you didn't salt the SV steak in the bag? I've always salted everything before adding it to the water bath, mainly because that's what most of the recipes I see do. Yes, there is a reason. Salting early seems to make things taste funny. But remember the steak in question sat a couple days in the refrigerator. Interesting. I've not noticed any off-taste, but I'm still an SV neophyte. I think I've only made steak three or four times. I'll need to do some experimenting. hopefully , you are not using salt w Iodine in it ? Forty years at least since I've used iodized salt. Probably more like fifty. Both steaks were salted. I didn't say the sous vide steak tasted odd. It just didn't have much flavor. I wonder if I could ask for a recommendation on the time/temp to pasteurize eggs. I am out of town and my notebook of such facts is at home. Thanks! Two hours at 55C. I'm doing up a batch at the moment. @JoNorvelleWalker... thanks much, I want to get some ready for making mayo. 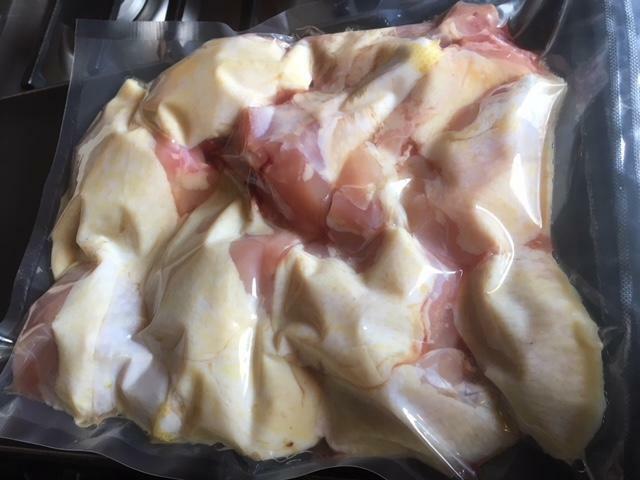 Sous vide and then fried chicken. 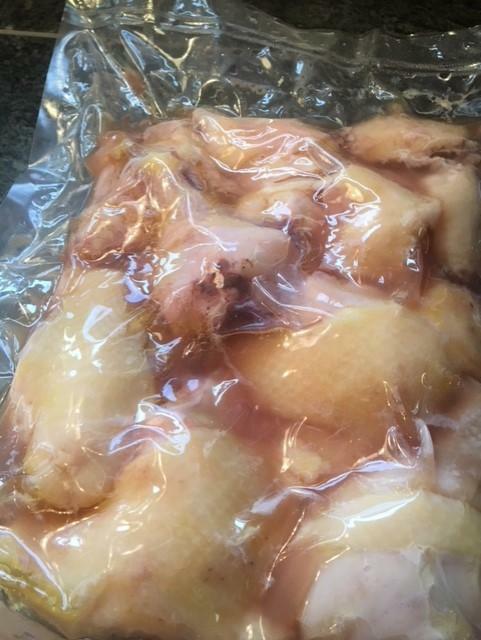 Brined the chicken in some salt water overnight. Or maybe it was more like 2 days. All ready to go in the water bath at 147F for a couple of hours. didn't use quarter cup of oil in the bag ? mighty fine looking fried chicken. No oil in the bag. 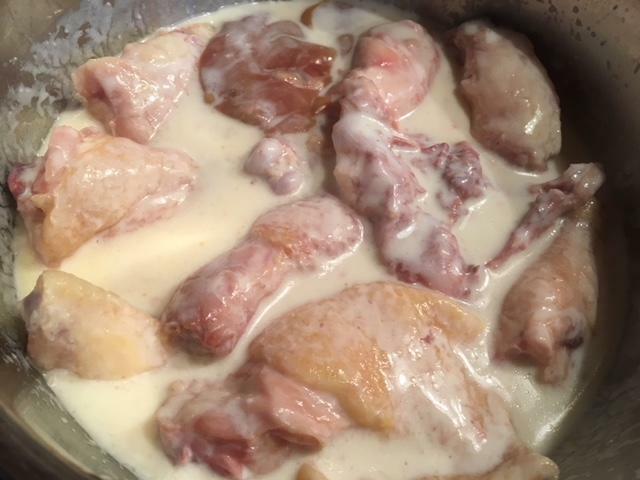 No, I didn't dry the chicken off after resting in the buttermilk. Just let it drip for a second and then right into the bag of flour. That is so gorgeous, I had to quote your photo. Yes, I made the gravy while the chicken was in the buttermilk and then kept it warm while I was frying. So sorry, but just for clarification: the meat is precooked via SV, then “rested” in buttermilk with beaten egg , then coated in flour and deep fried. @Shelby I concur - that is some fine looking chicken... did the chicken cool between the SV and buttermilk bath? How long did it fry for and what was your oil temp? Yes, the chicken did cool a bit while I was getting bowls and buttermilk etc. out and arranged. It wasn't piping hot when it entered the buttermilk/egg bath for sure. 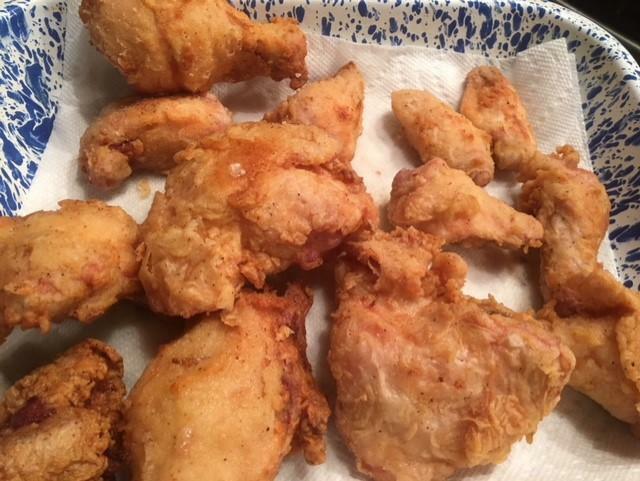 The oil temp was around 335F-340F when I put the first round of chicken in...I fried it until the bottom of the breading on each piece felt firm and crunchy and then flipped it over until it felt the same way again and each piece was that golden color. It probably took me about 30 mins in total to fry the whole chicken (minus the breasts--I didn't include them). I found it a bit easier (if you have the time to sous vide the chicken first, that is) to fry it knowing that the meat was already done and I was just going for the perfect golden, crispy outside. I'm quite interested to use this technique on tougher meats such as wild pheasant and rabbit...and maybe even frog legs.
" technique on tougher meats such as wild pheasant and rabbit...and maybe even frog legs. " Im guessing the rabbit Ive eaten in the USA , that comes from a butcher , is ' cage raised ?" but I wondered about using buttermilk in the overnight soak. SV , pat dry , then dip in fresh buttermilk for the coating series. I would guess the same thing about purchased rabbit, but I'm not sure. All I do know is that the rabbits that we harvest are pretty tough unless you do a long, slow bake in the oven. I've fried rabbit and then pressure cooked it, which makes it tender, but, as I've said before on here, the breading isn't crisp. Which, we like, but I'd like to try this method and see if it works. Yes, there are several domesticated varieties bred specifically for meat production. On one of our interminable trips between provinces, my daughter and SIL were chatting about his brother's pet bunny, and another that his cousin owned. The cousin's was a Flemish Giant, at which point I piped up unthinkingly and commented that "Oh, those are one of the best meat breeds!" think about it : Bunny Stock ! no matter , my father enjoyed it.